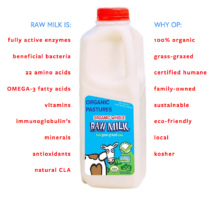 They say: “Founded in 2000, Organic Pastures Dairy is a 4th generation family farm that is state inspected and produces only organic raw dairy products from its on farm creamery near Fresno CA. Its raw grass fed products can be found all across the State of California in about 600 stores and 22 farmers markets. We are dedicated to consumer education and a full and transparent consumer-connection. OPDC is the 4th ranked brand of organic milk in the USA ( SPINS ) and leads with food safety testing and innovation with its first ever 12 hour Test & Hold prior to release to market program. We welcome all people to visit and tour our farm and creamery. Thank you! Extra Credit 155 Processor OSP submitted; this dairy gets all of their feed from domestic sources.